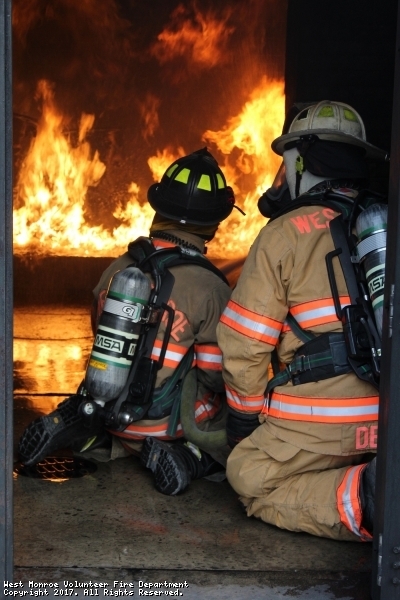 The West Monroe Fire Department responded to its 300th call of 2018 on September 28, the 271st day of the year. The West Monroe Fire Department finished 2017 with 346 calls. This was forty-eight calls fewer than in 2016 (394). The West Monroe Fire Department responded to its 300th call of 2017 on November 8, the 312th day of the year. 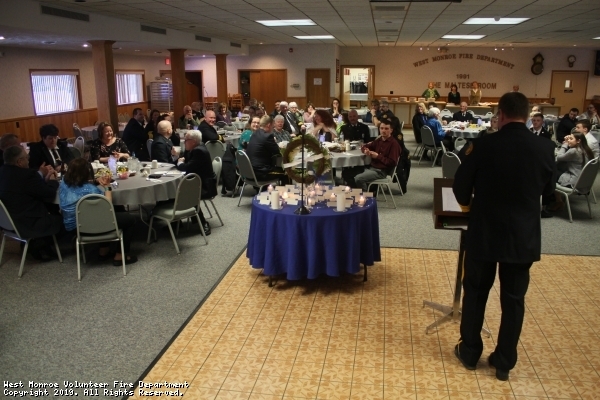 The West Monroe Volunteer Fire Department will be having a pancake breakfast at its fire station on Sunday, April 14, 2019 (Palm Sunday) from 8:00 a.m. until noon. The menu for the breakfast will consist of pancakes, French toast, sausage, ham, eggs cooked to order, toast, tomato, apple, or orange juice, coffee, tea, hot cocoa or milk. Prices for the event are: adults $8.00, senior citizens $7.50, children 5 – 12 $5.50. Children under five accompanied by an adult are free, and there will also be a special family rate of $25.00 for 2 adults and up to 4 children under 12. The West Monroe Fire Station is located on County Route 11 two-tenths of a mile north of State Route 49 in West Monroe. The West Monroe Fire Department Auxiliary is hosting an Indoor Spring Craft Sale / Garage Sale on Saturday, May 11th from 9:00 a.m. to 2:00 p.m. Contact Patty at 315-668-8756 for table reservations. 8' Tables or Table Space are $15 each. Food will be available for purchase. 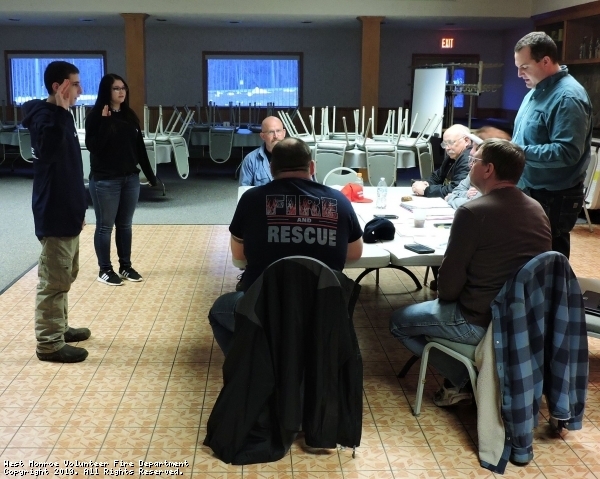 This past Tuesday night, we went back to the basics for drill. 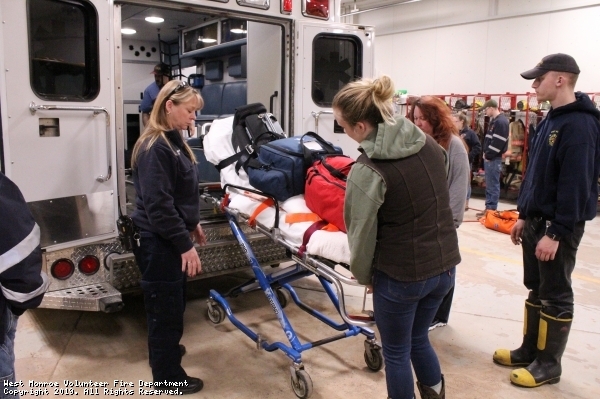 Menter Ambulance gave members the opportunity to learn and refresh their memory on where things are located in the rigs. Also, members were able to practice their skills on splinting as well as using gauze and tourniquets to stop further bleeding. 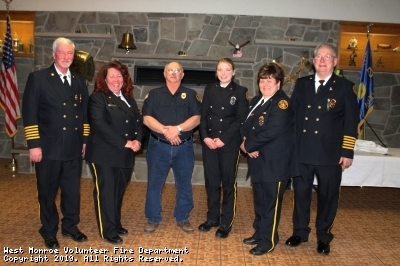 On March 16th, the West Monroe Fire Department installed officers for the year of 2019. A big congratulations to all of the elected officers. 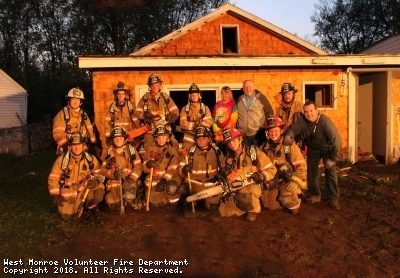 This past Tuesday night, members from West Monroe and Constantia participated in a firefighter challenge. 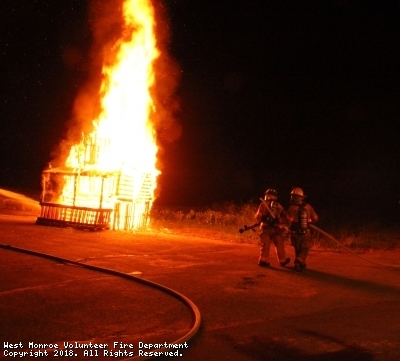 This consisted of different challenges a firefighter may face at a fire scene. 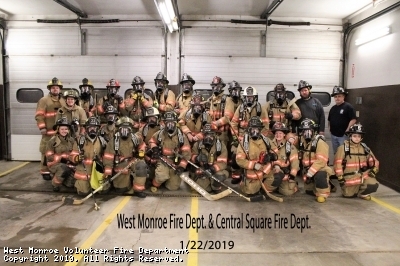 On Tuesday January 22nd 2019 the Central Square Fie Company and West Monroe Fire Department held a joint drill at the Central Square Fire Station. 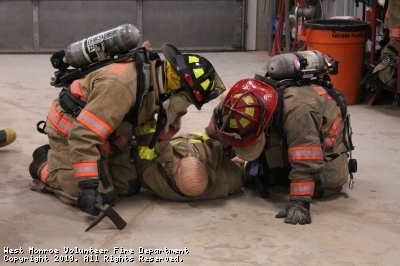 This was a drill to practice the use of the SCBA Air Packs. Tuesday January 19th, members set up a double port-a-tank operation. 3351 and 551 from Central Square took part in filling the port-a-tanks. This is practiced and set up if there is no hydrant near a fire scene. 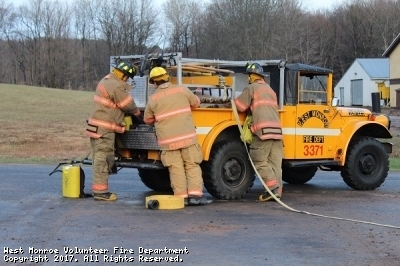 Early this morning, Rick Donegan and Mike Altier practiced pump operations and driver training on 3312. This Sunday drill was led by 3303. 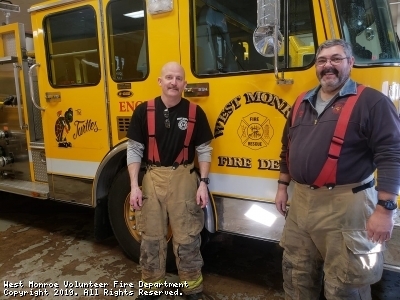 The West Monroe Fire Department finished 2018 with 398 calls. This was forty-two calls more than 2017 (346 calls), and was comparable to 2016 (394 calls). 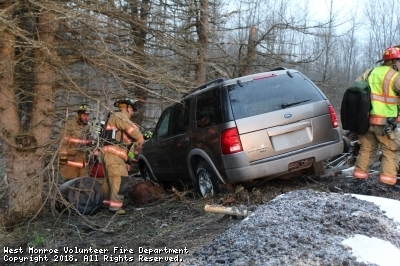 Tuesday December 18th, members were dispatched to a mock motor vehicle accident with injuries. 3361, 3312 and 3363 all responded to the scene. 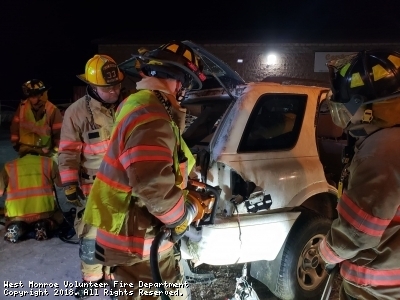 We used the two vehicles to use our extrication skills on and show members how to properly use different tools and techniques for vehicle accidents. Yesterday evening before drill, members made a special stop. We went and visited a young supporter of our department. This girl has been presenting us with donations at our last three pancake breakfasts. Thank you very much Shay! We appreciate every thing that you do for us. 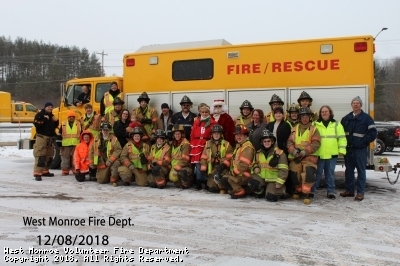 On Saturday December 8th, the West Monroe Volunteer Fire Department brought Santa around town to visit with the kids. We look forward to spreading the Christmas spirit every year. We would like to thank the Central Square Fire Company for letting us use 572 for this event. The West Monroe Fire Department responded mutual aid to Central Square for a house fire in the town of Hastings on Wednesday, November 28. The West Monroe Fire Department would like to thank everyone for making our 2018 Fire Safety Night a great success! We would like to express our gratitude to all the agencies that came to support our annual event. Also for all those who attended, we hope you gained some knowledge in fire prevention and safety. Congratulations to our newly elected officers to finish out the year of 2018. 3301 Jeff DeMong, 3302 Jack Gates and 3303 Dave Hanson. 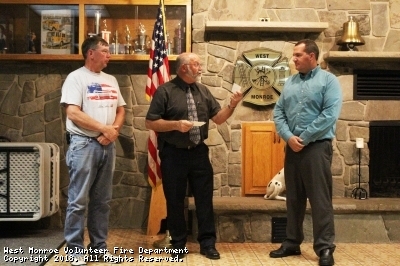 Dave Hanson was installed by Randy House, OS300 and Jeff was installed by his father John DeMong, past chief of the West Monroe Fire Department. Jack Gates who was not present will be installed at a later time. There's no summer vacation for us, this summer is full of training opportunities. 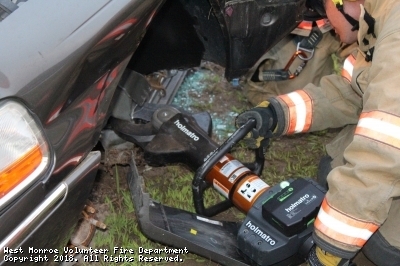 Tuesday evening members used hydraulics and battery powered spreaders and cutters for vehicle extrication. Special thanks to Mitch and Rick from HAR-ROB Fire Equipment for showing us new tools and skills to use for motor vehicle accidents. Tuesday evening we were asked to do a stand by at 916 Riverside in Brewerton for the firework display. The Caughdenoy Fire Department, Central Square Fire Company and Menter Ambulance also stood by in case we were dispatched to any calls. A good time was had by everyone. Tuesday the 26th, we simulated a motorcycle accident. There was two victims with unknown injuries when we arrived on scene. 3312 was instructed to set up a landing zone while crews from 3363 and 3361 took control of the patient care. 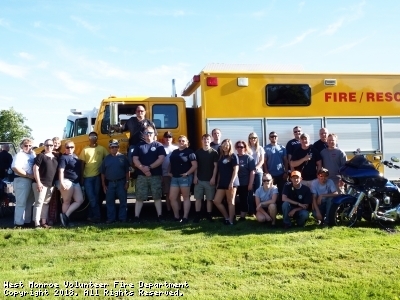 On Sunday, June 24, 2018, the 175th day of the year, the fire department responded to its 200th call of the year. 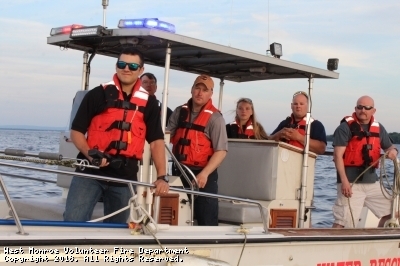 Tuesday June 12th, we divided into two different groups for a boat operation drill. We went over our rescue boat and practiced towing and hooking up to a boat if there is a boat in distress call on Oneida Lake. Members also practiced driving 33WR1. 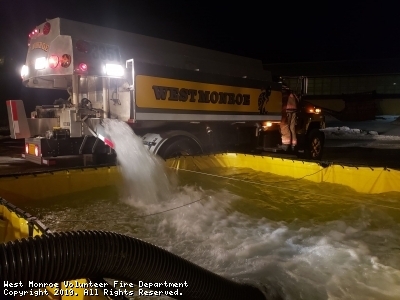 Tuesday night we drafted water from Dutch Pond using a double port-a-tank operation to supply water. 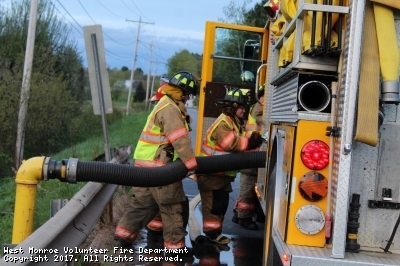 Tanker 3351 and tanker 551 from the Central Square Fire Department were both providing water to the setup. This was great practice for everyone who attended. Tuesday night we were able to practice many different skills using a drill house. Many scenarios were played out. We are very fortunate to be able to use this house to drill in. Thank you to the home owners. 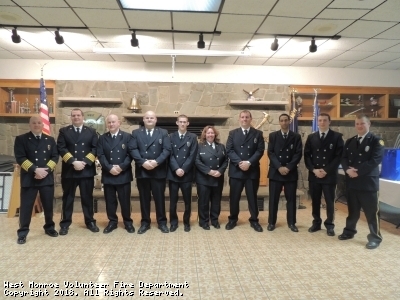 Tuesday nights drill we went to the Emergency Response Training Center in Oswego. We practiced our interior fire fighting skills. This was great scba practice for everyone. Central Square Fire Company. 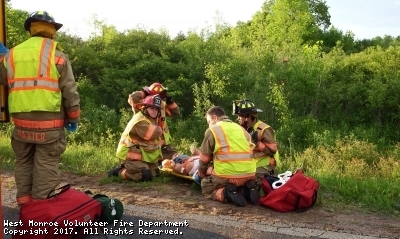 We simulated mutual aid to the scene of a motor vehicle accident reported by witnesses. 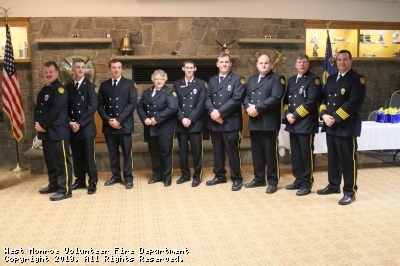 There was great teamwork displayed between both departments. 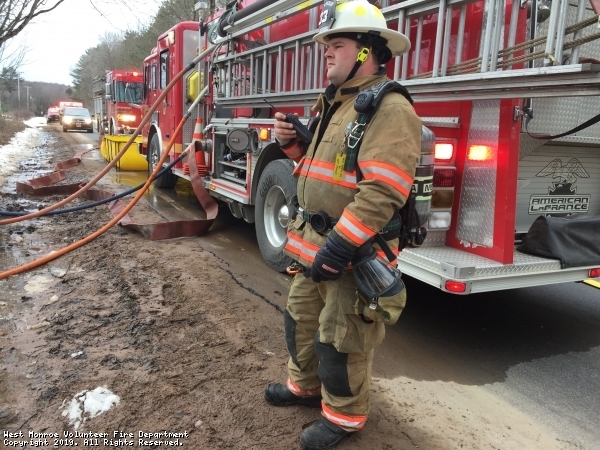 On Saturday, April 7, 2018, the fire department responded to its 100th call of the year. This is eighteen days earlier than Call 100 in 2017 (April 25). 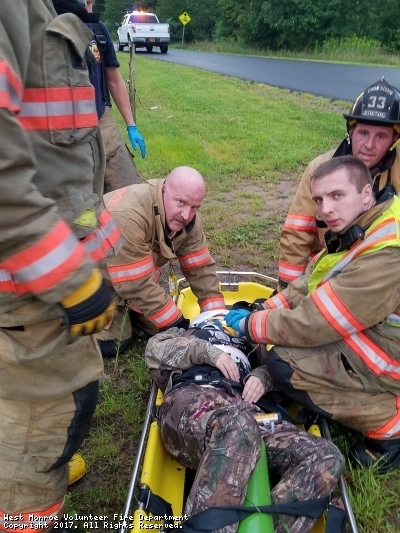 Wednesday February 21st, the West Monroe Fire Department teamed up with Constantia, Cleveland and Central Square for a conjoined drill with the Coast Guard. We practiced and learned many ice water rescue techniques. 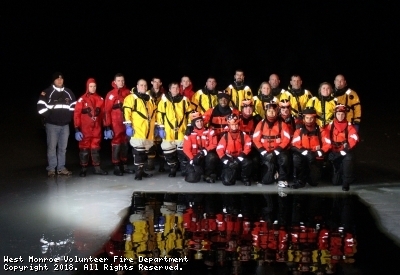 Thank you to the U.S Coast Guard for demonstrating new approaches to ice water rescues. 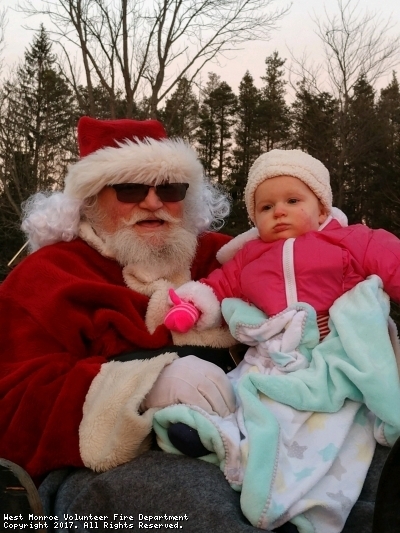 Today was a great day to bring Santa around the town. We would like to thank everyone for sharing your children with us. Also thanks goes out to everyone who provided us with treats. 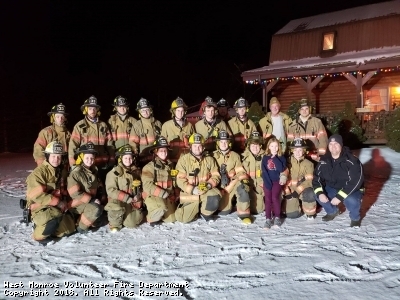 We enjoy doing this every year for everyone in our small town. The West Monroe Fire Department responded to its 300th call of the year on Wednesday, November 8th, the 312th day of 2017. 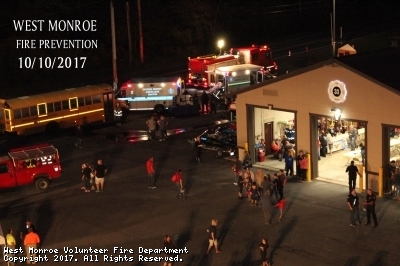 The West Monroe Fire Department would like to thank everyone for making Fire Safety Night a great success! We would like to express our gratitude to all the agencies that came to support our annual event. Also for all those who attended, we hope you gained some knowledge in fire prevention and home safety. 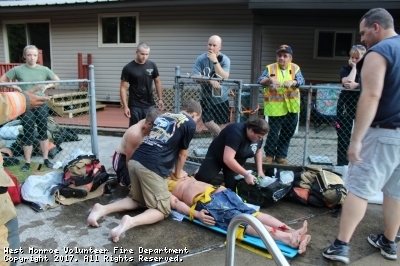 August 8th, crews simulated a pool drowning. Crews had to rescue a submerged victim and then simulate starting BLS care. Special thanks to Menter Ambulance for assisting and giving us constructive feedback. 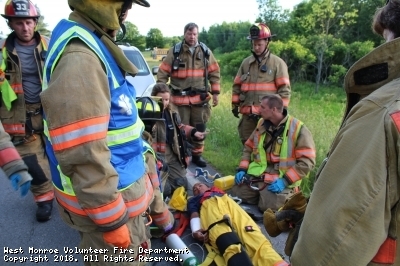 This past Tuesday night, members took to the fields for an ems/rescue drill. The drill required the use of hydraulics for a trapped patient. This helped members with their ems skills along with rescue. Drill with the Central Square Fire Department in a friendly competition of push barrel. 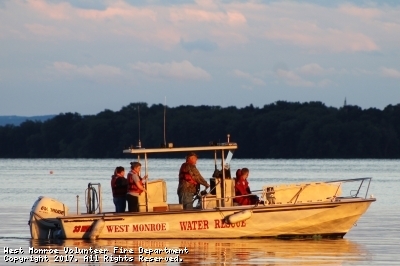 On Tuesday night, members took the water rescue boat out on Oneida Lake and simulated a disabled boat rescue. Also simulated was a rescue of a person in the water. injuries and an unknown number of patients. 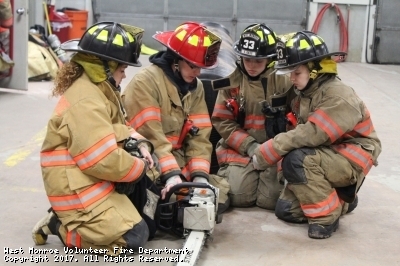 On Tuesday May 16th, members went to the Emergency Response Training Center in Oswego for drill. 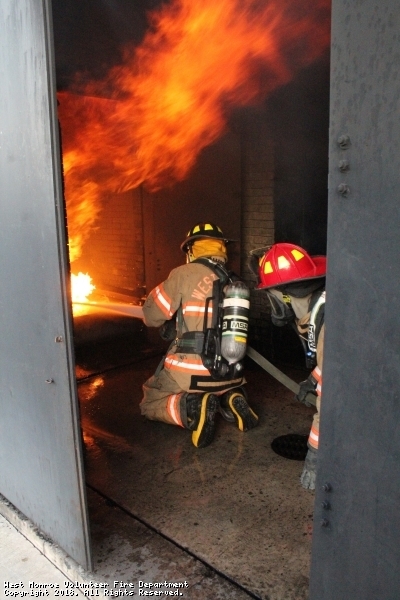 Here they practiced their fire fighting skills from inside a burning building. This is important and essential to keep interior skills sharp. 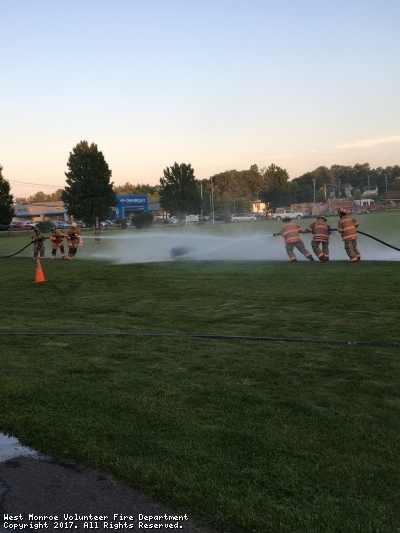 On Tuesday night, members split into groups and went to different dry hydrant locations in the district. They back flushed the hydrants of debris and drafted water. The West Monroe Fire Department responded to its 100th call of 2017 on April 25. This was twenty days later than the department's 100th call of 2016. 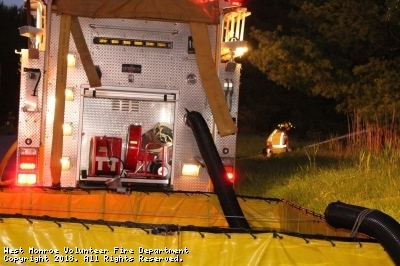 The West Monroe Fire Department was one of the departments responding to this call. stations were set up with events that can occur on a brush fire scene. simulating events that they might encounter on a fire scene. This site has been viewed 477,299 times.